At Concept Virtual Design we work with the most inspirational luxury suppliers, to bring you the highest finish possible for your private client project or luxury development. 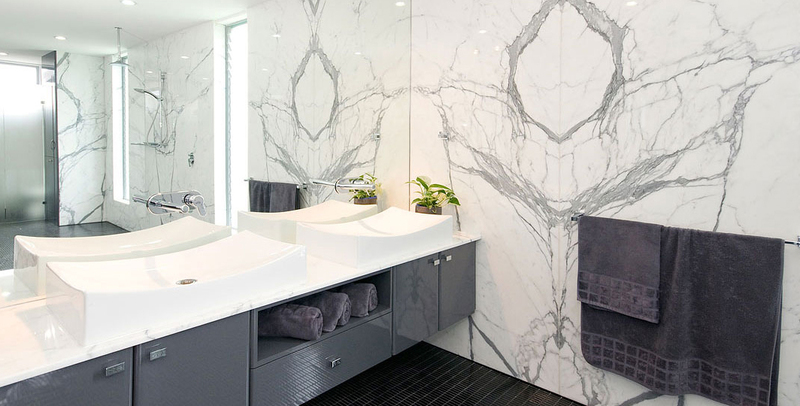 We will often use natural wall and floor finishes for our bathroom projects – marble, granite, limestone the highest quality marble effect porcelain. The addition of stone or marble to any room promotes peace and tranquility while bringing a timeless feel to any luxury project. This showstopping Calacatta is a marble effect porcelain tile, which comes in a matt or polished finish, it is designed to replicate the beautiful veins and movement of Calacatta marble. This tile gives a smooth flow to any room and creates a relaxing space within any luxurious room. You can use this lightweight porcelain tile for a variety of components in any luxury project or development, to create a stunning statement. 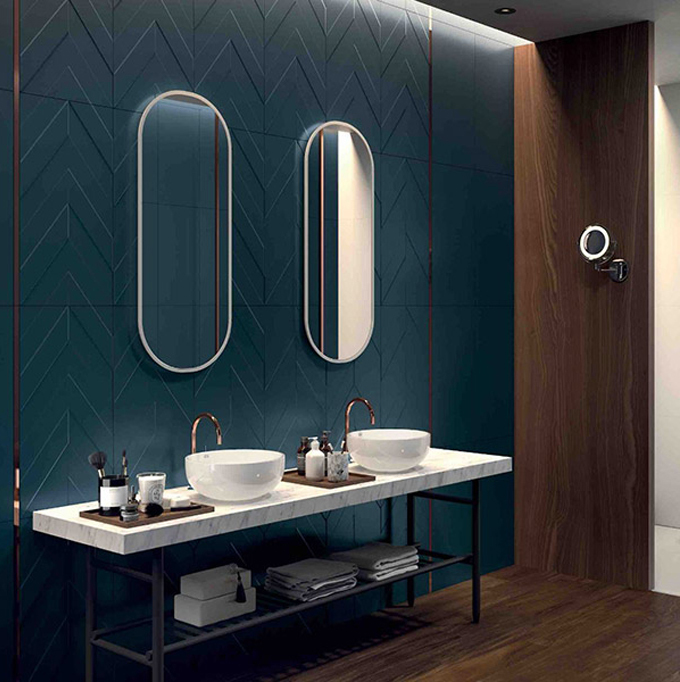 If you are looking for more of a modern twist then the newly introduced Blue Chevron porcelain tiles are the perfect fit. They are part of the 4D range which focuses on the aesthetics of three-dimensional shapes to bring volume and character to any room. This tile can be used to create a sophisticated statement when used in a small area or can be used to enhance the bold beauty of a room by using it in larger quantities, offset by more delicate pieces in the room. 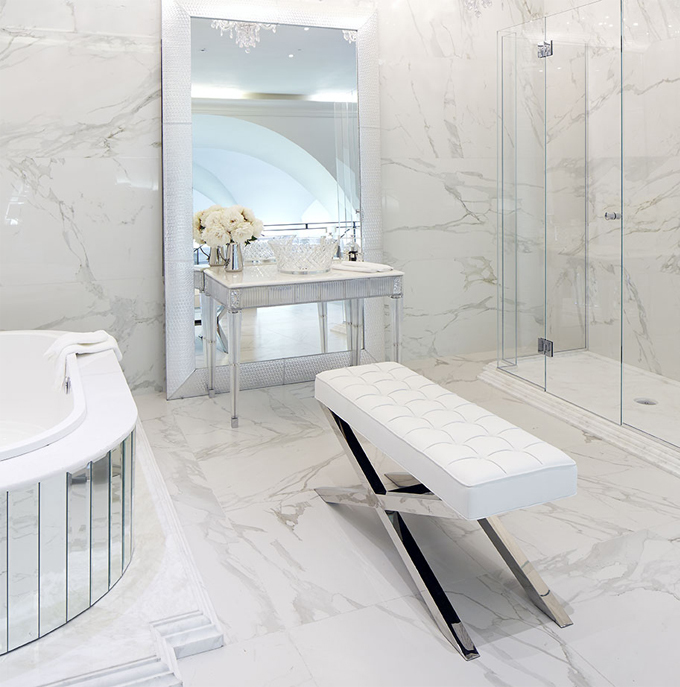 Statuario is one of the most well known white marbles with its striking grey veining. This marble can act as an eye-catching piece within your bathroom or the beautiful grey marbling can be used to accentuate colour features within the room to give a timeless feel, tying together modern and classic features. At Concept Virtual Design, we work with the most up to date, timeless styles and colours, to ensure that your refurbishment project or private client new build project is completed to the highest standard and finish. To find out more about how our in-house design team can help enhance your project, please contact our team to visit our specialist bathroom and tiles studio. Our in-house design team are available for consultations by appointment and are often brought in at the start of the architectural design process or building process to ensure that the correct bathroom space is created and that it is optimised from day one to produce the most luxurious space possible. This entry was posted in Luxury Developments, Luxury Interior Design and tagged Bathroom Design Ascot, Bathroom Design Henley on Thames, bathroom design Maidenhead, Bathroom Design Marlow, Bathroom Design Sunningdale, bathroom design virginia water, bathroom design Windsor, Beaconsfield bathroom design, Gerrards cross bathroom design, Luxury Designers, Luxury Designers And Suppliers, Luxury Suppliers, marble bathroom design, Marble Showers, Marble Tiles. Bookmark the permalink.